From the Clay Forests of Yuanmou County to the dinosaur bones of Lufeng, Chuxiong Yi Autonomous Prefecture is steeped in a history that stretches back millions of years. The fossilised remains of the Yuanmou Man, an ape-like human ancestor that lived over 1.7 million years ago, were discovered here in 1965 and evidence of human activity predating the Qin Dynasty (221-206 B.C.) has been found throughout the prefecture. Thus it comes as no surprise that many Chinese people regard Chuxiong as the cradle of mankind. 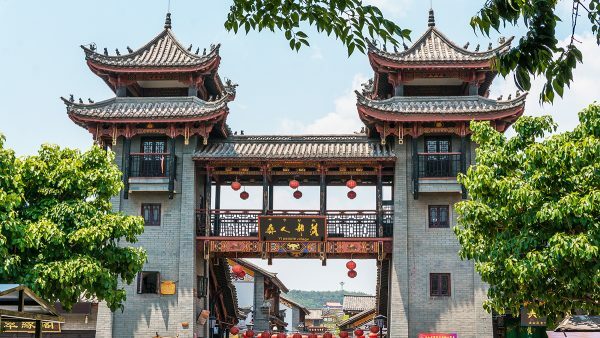 The prefectural capital, aptly named Chuxiong City, is a central hub that acts as the midway point between Yunnan’s three most popular tourist cities; Kunming, Lijiang, and Dali. Tragically this often means Chuxiong gets overlooked by foreign tourists so if you happen to be passing through, take a couple of days to explore this strange and wonderful place. After all, you may come across your great-great-great-great-great-grandfather! The prefecture was so named because, of its 2.5 million inhabitants, over 26% of them are from the Yi ethnic minority. Up until the Ming Dynasty (1368-1644), the Yi people were in the vast majority throughout Chuxiong but were swiftly overcome by the ethnic Han people when they migrated from Central China to Yunnan. Nowadays the prefecture is the ideal place to learn about Yi culture and visit traditional Yi villages. In the northwestern district of Chuxiong City, there is even a tourist attraction known as the Ancient City of the Yi People, which is not actually an ancient city but provides tourists with the opportunity to watch Yi residents perform traditional dances and purchase a few locally made handicrafts. The city itself is home to a plethora of local parks where visitors can relax and enjoy a peaceful day out. Futa Park or “Park of Good Fortune” is home to the looming Futa Pagoda, a nine-storey behemoth that towers over the city at nearly 60 metres (197 ft.) in height. A harrowing climb to the top rewards any visitor with a breath-taking panoramic view of the city and outside the pagoda you’ll find a large statue of the Laughing Buddha, whose belly button has been worn smooth thanks to visitors rubbing his pendulous stomach. Perhaps he’s laughing because he’s ticklish! Taiyangli Park, also known as the Ten Month Calendar Garden, is possibly the most famous park in the city as it was designed around the Yi people’s ten month calendar and features beautifully carved statues from the Yi Zodiac. Their version of the zodiac includes several animals that are absent from the traditional Chinese zodiac, such as the pangolin and the peacock, and several other bizarre decorations, such as concrete gourds that are large enough to stand in and what appears to be a graveyard for abandoned paddleboats, can be found littered throughout the park. Outside of the city, the delightfully odd attractions appear to multiply! To the southwest you’ll find the magnificent Zixi Mountain, which has been considered a sacred Buddhist site since the Song Dynasty (960-1279). The Zixi Mountain Forest Park is an ideal place to go hiking, as Buddhist temples and ruins are scattered across the mountain. With its lush pine forests, 202 resident plant species and 107 animal species, the mountain’s rich biodiversity makes it a hotspot for nature tourists. In Yuanmou County, you’ll find the three clay forests, known as Hutiaotan, Banguo and Xinhua, where extensive water erosion has caused rocks to form unusual natural landforms over centuries. These landforms look like animals, trees and plants frozen still in time, trapped inside the immovable rock. There’s even one formation that supposedly looks like a Catholic Church; but don’t show up in your Sunday best as you’ll be bitterly disappointed to find they don’t celebrate Mass! In Lufeng County, the complete skeletons of four dinosaurs are on display in Lufeng Dinosaur Museum and the numerous exhibitions provide visitors with an insight into earth’s ancient past. We recommend visiting Chuxiong in late summer, as the Yi Torch Festival takes place in August every year and is one of the major highlights of the Yi calendar. The festival features a stunning torch parade, singing, dancing, and the playing of traditional instruments well into the night. It’s a lively display that is not to be missed; just don’t get too carried away with your dancing or you may fall into the bonfire!